'Little Ipswich', the Chalmers Wood Jr. estate designed by Delano & Aldrich c. 1927 in Woodbury. Wood was a founding partner of the firm Johnson, Wood & Rogers. 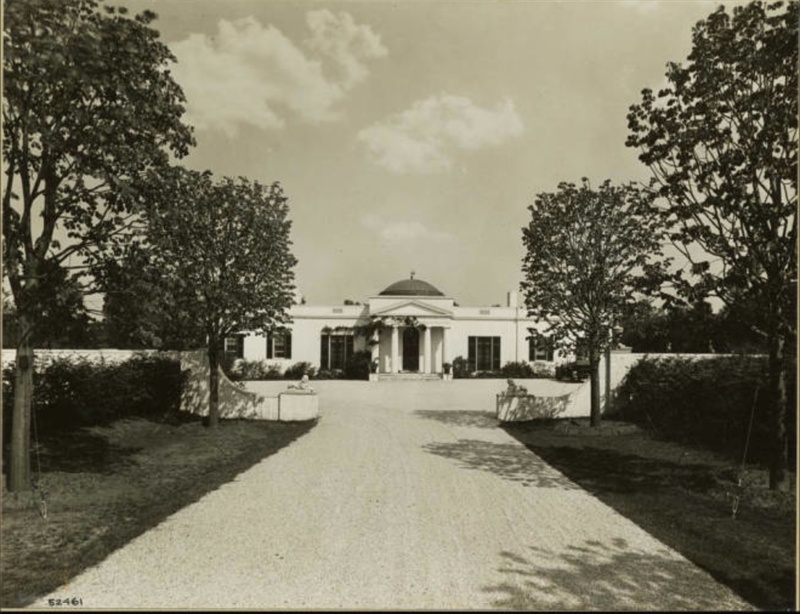 His first marriage ended in 1924 and the same year he remarried the interior designer Ruby Ross Wood. 'Little Ipswich' was demolished in the 1990s. Click HERE to see where 'Little Ipswich' stood on google earth. Photo from the Ryerson & Burnham Archives at the Art Institute of Chicago. Click HERE to see 'Little Ipswich' intact in a 1966 aerial. Never understood why this was demolished. Was it in bad shape? HPHS: condition had nothing to do with its demolition. Look at the site on google. It was purchased by a Slash & Burn developer, who only saw a piece of land and how many parcels it could be divided could be gotten--existing features rarely figure into the developer's thinking. And what a pity. This one was one of the best. Seems to be that I remember reading a quote--probably Billy Baldwin?---referring to Mrs. Wood's 'nice foxhunting husband'. could be shoehorned from its division, wrested from its division, raped from its...world without end, amen. Thank you for sharing this photo. Little Ipswich and Cloverly Manor are two examples of Delano & Aldrich's best work. Has anyone every located plans for Little Ipswich. Due to size and massing I am wondering what the layout is like. All the best for 2013. Most people who have seen the layout know why it was torn down- the layout was nothing short of terrible- far from Delano and Aldrich's best work. Aesthete's Lament knows the layout and said that even Ruby Ross Wood felt that the layout was a mistake. but mainly tossed and mildewed. some of what was undamaged. rooms at Little Ipswich as a house builder's sales office. Sales brochures were left in evidence as was a probably once very lovely table and 2 equally fine chairs. The rest of the place had been ransacked. A rowboat was still afloat on the pond. name known to me then. Anonymous 7:31...please tell us why the layout was so bad. Seems a perfect house from what I can see....please elaborate. "Most people who have seen the layout know why it was torn down- the layout was nothing short of terrible"
Again, the "layout" of the house is not the reason it was "torn down." The house itself stood amidst a 29 acre estate which was ALL cleared to make way for a major housing development. From reading about the house it appears that the plan did not employ hallways/corridors leaving each room to open into another. That can account from some of the awkwardness. Still a beautiful house. Anonymous 10:09, what compelling memories! As to the planning---I seem to remember that Billy Baldwin admired the layout. Certainly rooms opening into each other is not unusual---and usually desirable. The house was u-shape--a bedroom wing and a service wing. With space and air in every one. Whether we've done it ill or well. The time has come to write "exit." Pray God that peace may be with you. He liked the home so much he requested "Little Ispwich" to be used as a backdrop to his portrait. Still I would enjoy seeing the plan. Too bad the brilliance of Delano & Aldrich is lacking today. Allan Greenberg does measure up though. Little Ipswich is an intriguing place. Actually worth purchasing the historical aerial. In the catalog of the Parish Art Museum exhibit of Long Island country houses, from many years back, there is illustrated the Wood's Christmas card, a delightful woodcut aerial view of the estate---well worth seeking out. I see that the last owner of Little Ipswich was Count Giorgio Uzielli, whose son Gianni was for a time son-in-law of Henry Ford II. while it was still a fairly new ruin. The layout unusual, strange, and I think very personal - While there, I photographed the house and drew exact plans.I am not sure any others exist having looked for them at the Avery library and elsewhere. A discription of the house would go like this -Starting at the front door -the domed foyer with swans painted on the ceiling... directly ahead through the long French doors and across the exterior slate-floored court, a view to the lake and the two great trees that completed the vista. On either side of the door small his & her powder rooms. Directly to the right the paneled library with a corner door that led to a long corridor with the drawing room at the end facing the lake, strange - along this corridor were the master suites of Mrs Wood and her husband behind a couple of doors. Her bedroom had a magnificent antique floor of parquet stars from a French chateau(which was bulldozed along with the house),all marble mantels in the house were removed prior. I still have a peice of her bathroom wallpaper with its blue/green plaques with sphinxes, garlands and cupids against a beige back ground. His bedroom had very old delft tiles surrounding his fireplace. A friend managed to save these days before the house was reduced to rubble. How shocked we were to see this huge debris pile one summer afternoon after walking the silent darkly shaded drive lined with pines. 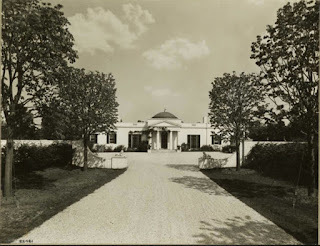 The master bedrooms and the drawing room opened to a series of gardens on different levels that rose to a swimming pool, which was left half out of the ground when the area was being demolished. Again starting in the round foyer to the left were a small morning room or office and the large French dining room with a curved wall that framed the fireplace. (It is said that the large swans would sometimes enter the room looking to be fed - and terrify the guests. Again, strangely this formal room led to a small pantry/hall that led to two guest rooms facing the lake and completing the "U". Service rooms were left of this area.I can only guess these guest bedrooms were used mainly in the warm months and were mainly accessed from the French doors facing the courtyard. Another interesting thing was that the domed center roof had a unusual (missing) swan weathervane. In photos it seemed small, but seeing a picture of myself standing in its place I was about the same size! Thanks estateman! Any kitchen details? To answer "half puddin", (enjoy your blog),... the kitchen was behind the curved fireplace wall in the dining room. and was very 30's modern - white, simple deco cabinets, chrome handles and a linolium floor that I beleieve was two shades of green. A service porch/hall lined with windows faced the service court.The butler's pantry/connecting hall to the two "orphaned" guest rooms had built in oak cabinets had a stairway to the attic. To answer The Down East Dillettante,(congrats on your wonderful blog)... I am torn in releasing these floorplans since many of the previous plans I had drawn of varias great houses across the country have been used on the internet without my permission. These were expressly drawn and paid for by a privately published author, and used in his books. I am currently working on one myself. My collection of country house information will be made public in a nationally famous library in some years to come. It was inspired by the gate-lodge at Kimbolton Castle by Robert Adam. It was placed so that it was on access to the two great oaks 50 ft apart across the pond. Had a detached four car garage. Ruby and Chalmers served excellent, mostly very simple southern food, (Mrs. Woods was from the south). The round domed foyer was painted in shades of terra cotta, white and black brown.The curtains were of pale blue watered Italian silk patterned with white stars. The floor was centered with a large black/brown star. The only furnishings were 4 English terra cotta figures of the four seasons. The symbols of the house were stars, swans, sphinxes and horses reflecting their interests. The pine paneled library was designed starting with an antique carved Adam overmantel of sphinxes, an urn and flowers found in a London house.The Library floor had a rare Aubosson rug with four swans. (She hated putting it on the floor due to the foot "traffic" -(the long hall to her suites and the drawing room). I would assume due to it's VALUE. Her bedroom had an antique French parquet floor inlaid with circles and stars, as I said before lost to demolition. She designed many of the gardens that wouild have enough color in the fall and winter since they used the country house all year long. She was known for her ruby colored glasses, and her cabochon rubies. She loved playing solitaire in her older years which was later replaced with televsion and baseball. She died in 1950. A year later, it is said Chalmers died of a broken heart. The house lost its garage to a suspicious fire a few years before it was sadly demolished. Thanks estateman. The hunt is on for for those Vogue issue. Where there floor plans in the articles? Sorry, HalfpuddingHalfSauce, there aren't plans in any article I have seen. estateman - what about title on the two articles? Thanks for all this information! I'm so glad I stumbled upon this site. It broke my heart when this beautiful home was torn down to build more Woodbury McMansions. My ex-husband grew up living in the apartment above the garage. His grandparents were employed by Mr Uzielli (his gpa was the Chauffeur & gma was the Asst Chef) from the early 70's-mid 90's ish. At that time the estate was called "Lake House". We knew each other since we were little kids so I spent a lot of time at the estate. It was beautiful. We used to play in the house all the time. I remember the lay out was akward and as described above. There were HUGE paintings throughout the house. I think a few portraits of Mr/Mrs U. I think she was a Rothchild. At the time it was the Summer estate to the Uzielli's were not there often. In the late 80's/early 90's there were rarely there so we would swim in the pool and walk in the garden's. The roses were especially lovely! Someone mentioned the rowboat found on the lake at the time of the demolition. We rowed in that boat all the time. We would cross the lake and sit on a metal bench on the far side. I seem to remember the bench still being there when the new houses were going up. As a teenager my ex had the responsibility of raking the driveway which was made of crushed shells. The estate had white tailed deer and the Uzielli's bred dalmations. I loved playing with the puppies when I was a kid. After the Uzielli's passed their son sold the property to developers. I believe this was in the early-mid 90's. It was at that time that my ex's grandparents had to move out. There were given several ceramic dalmation dog statues, paintings, and other amazing antiques. I believe they were also given China, silver and crystal. Shortly after they moved we went back to vist and it was so sad to see the condition of the place. I do remember the "sales" center inside. My husband was so upset by it all he wouldn't even go inside to take a look. It really was sad to know that the new home owners had no idea of the beautiul estate home that once exsisted on that corner piece of property. oh well...I have fond memories of that home. I loved playing in those big rooms. Mr Uzielli passed in 1984 which makes sense why the house was empty in the late 80's until the land was sold in the early 90's. We went to Syosset HS (in the mid 80's) which was down the street and used to walk to Lake House during lunch and after school. The house was kept up well until my ex's family left. I've seen many pics of the house in it's hayday probably 60's-70'sof beautiful parties held on the patio in the back courtyard over looking the lake. I have a copy of the Vogue article and would love to share it here. Not sure how to add it though.